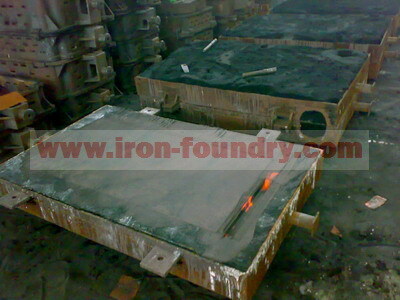 Dandong Foundry produced several types of cast iron plates for our clients in USA. 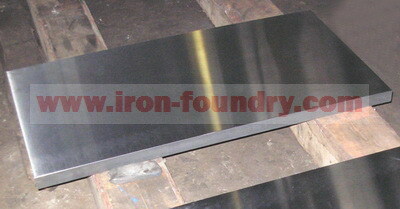 Cast iron plates are usually made by grey iron ASTM A48 CL 30, CL 35, CL 45, ductile iron ASTM A536 60-40-18, 65-45-12, 70-50-05, 80-60-03. They have higher wear resistance, corrosion and pressure resistance. In order to get better quality, especially reducing the casting defects inside and on the surface, we produced iron plates by resin sand molding, although the intensity of this molding is very high, but some iron casting defects such as sand holes and clip sands will still appear. It is mainly because sand cleaning is not thorough. There is residual sand in the mould. 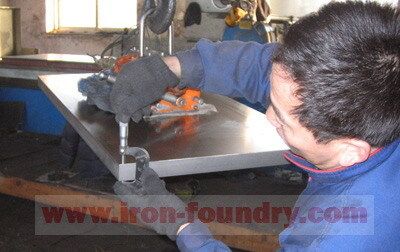 Secondly, the washing of iron liquid to the mould wall could cause the sand holes either. In order to improve the sand hole defects, the iron foundries should use the ceramic pipes for the cast gates. The ceramic pipes are easy to use, they have smooth flow and resistance to molten iron. It can improve the layout of gating system, casting quality and finished product ratio, and avoid sand holes and clip sand defects in iron castings.